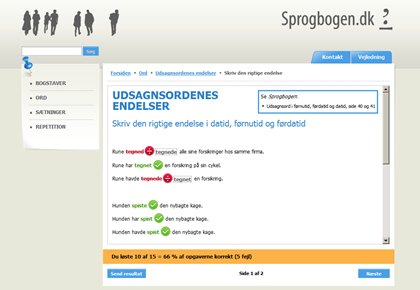 Online education: Sprogbogen.dk _ Mathias Vestergaard Corp. Since 2001, I have been involved with the Netfidus-project, providing afforable online learning to schools around the country. From the outside, the system is relatively simple: chose a type of task, solve it and get your results. What makes it interesting, is the back end system. Through the utilization of both the knowledge and some of the technology from Netfidus we developed a simple task specification syntax and a back-end system that could handle these tasks. The task specification syntax is completely text based, therefore, there is no special design-interface required. To create a simple task where the user has to input the correct ending of a word, you simply type “He was run_ning_”. Here the user must type in ‘ning’ after ‘run’ to get a point. To create a task with a spelling mistake you type “This is spel(l)ed incorrectly”. Here the user will see the sentence “This is speled incorrectly”. To get a point he or she must put in the missing ‘l’ in spelled. With simple syntax constructions like this, the editors of the site were able to build complex sets of tasks, training special skills. My role in this project was to design the syntax and handle the practical implementation. Henceforth, I developed a plain demo for myself, however, for the actual coding and implementation, I hired a development company in Belarus, Minsk, which has also handled the latest revisions of the Netfidus platform. This has given me quite a lot of experience with outsourcing. However, I must admit that I’m not that qualified for this part of the project role. The fact that one finds oneself in the middle, between client and the development company can be very frustrating and time consuming.